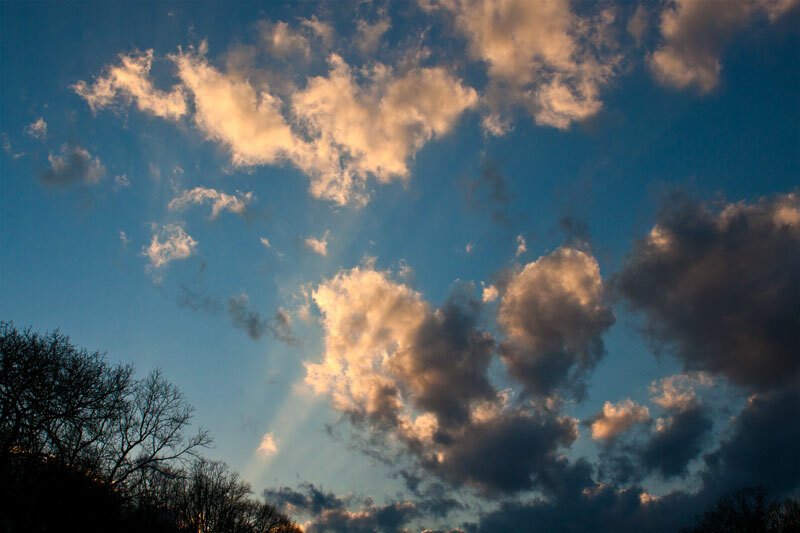 The evening sky in Fairfield Glade, Tennessee. March 18, 2011. Everything in Spring seems bright and beautiful. Last Saturday evening we were walking on the golf course behind our house at sunset. The sun was dropping below the Plateau, and the eastern sky was turning dark. But the sun was still hitting some of the clouds in the western sky. All in all it was a beautiful evening. Betsy and I will be taking a blog break for about a week. I’ll be back about April 4, the yard willing. 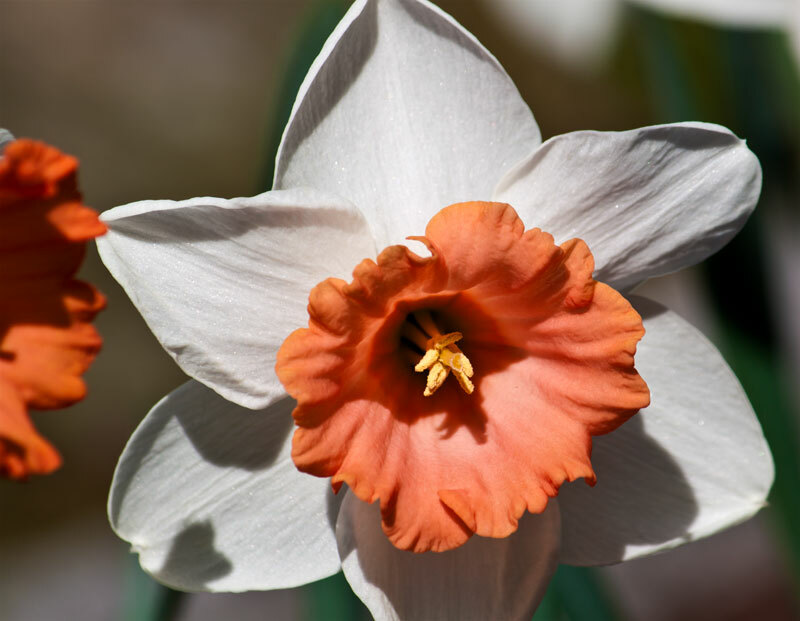 Fortissimo Daffodil, Fairfield Glade, Tennessee. March 20, 2011. It’s beginning to look more and more like Spring on the Cumberland Plateau. We’ve enjoyed some beautiful weather over the past few days, and flowers are beginning to bloom profusely. We’ve had some yellow daffodils blooming for several days, but now some of our other daffodils are blooming as well. 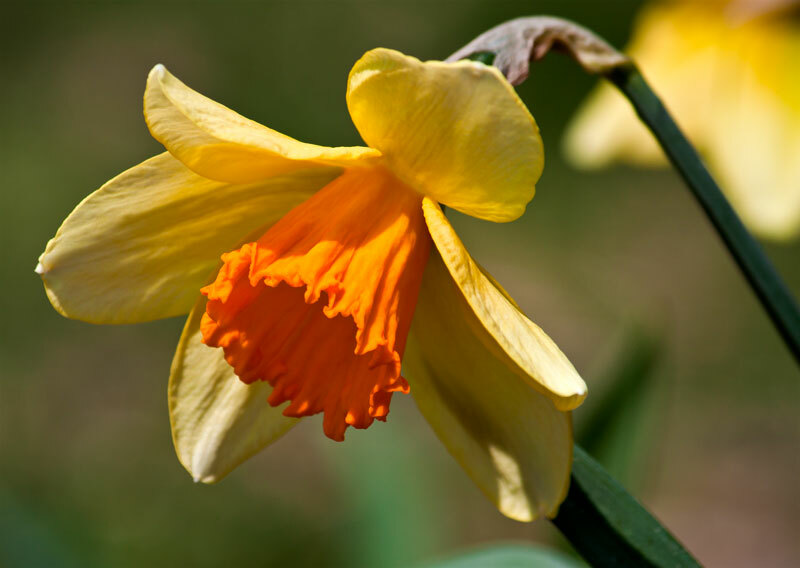 The daffodil above is Fortissimo. The petals are yellow, but the trumpet is orange. It’s a fairly large blossom. Chromacolor Daffodil, Fairfield Glade, Tennessee. March 21, 2011. Chromacolor also has an orange trumpet, but it is much shorter than the one on Fortissimo. Chromacolor’s petals are a showy white. Both of these daffodils happily proclaim that Spring has sprung! 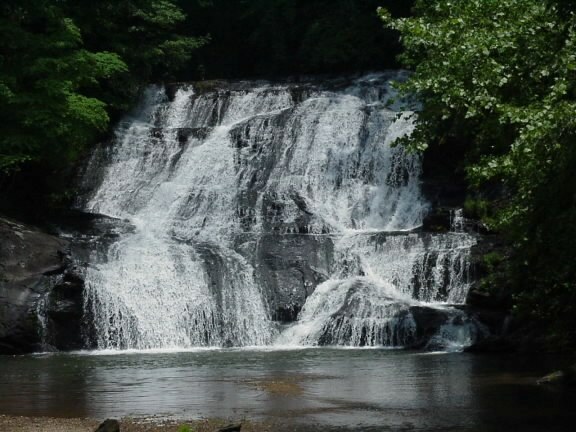 Cane Creek Falls, Dahlonega, Georgia. March 9, 2011. Cane Creek Falls is a waterfall near Dahlonega, Georgia, which Betsy and I visited while we were in north Georgia during my birthday trip. I’ve mentioned that we had quite a bit of rain during that trip, and you can see the muddy water thundering over the falls in the picture above. Cane Creek Falls, Dahlonega, Georgia. May 25, 2005. 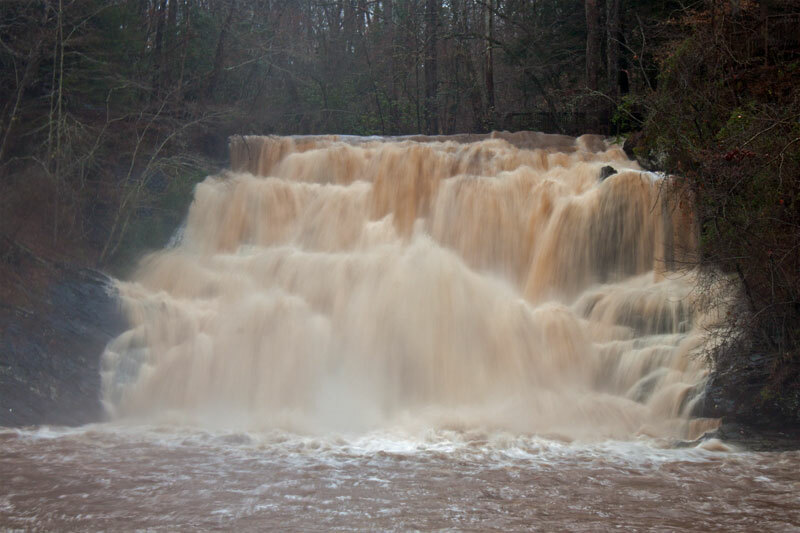 This trip wasn’t the first time we’ve visited Cane Creek Falls. We were also there in May, 2005. At that time the water levels were more normal. It almost looks like a different waterfall. Our new rose bed. Fairfield Glade, Tennessee. March 19, 2011. 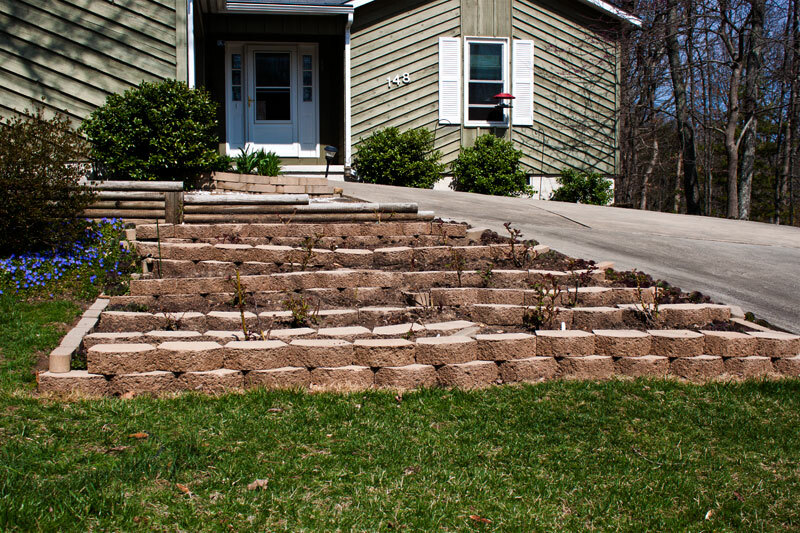 Spring has come to the Plateau, and that means that there is more work to be done in the yard. I finished up one big project — rebuilding our biggest rose bed. Hopefully the new bed will allow me provide a better growing environment for the roses this year. Speaking of roses, the weather has been so nice that all of the bushes are showing new growth, so I have been uncovering them. I should have them all uncovered in the next day or so. The container roses were growing so much in the garage that I’ve already moved them outside. 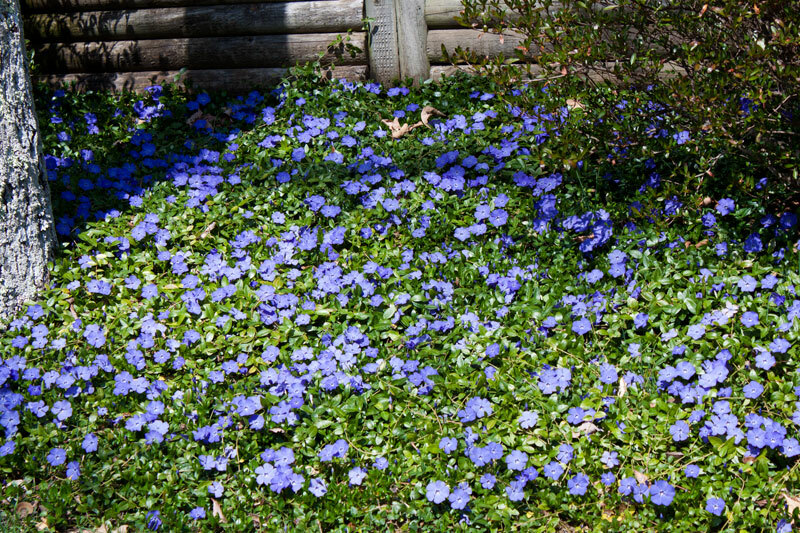 Periwinkle Bed, Fairfield Glade, Tennessee. March 19, 2011. Fortunately not everything in the yard has involved hard work this Spring. The periwinkle that we have growing in the rocky areas where grass won’t grow is putting on a beautiful display. Later in the year I’ll have to worry about keeping it in its bed, but right now I can simply enjoy. Sunrise Point, Mount Nebo State Park, Arkansas. December 4, 2008. 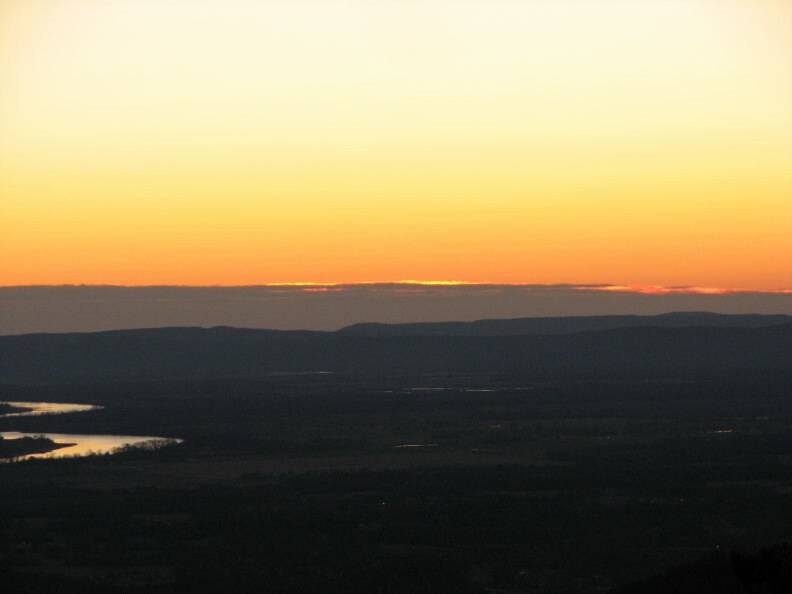 This picture of dawn’s early light was taken from Sunrise Point on Mount Nebo in Arkansas. The light is reflected on the waters of the Arkansas River in the valley below. A morning view from the lodge at Amicalola Falls State Park, Georgia. March 10, 2011. When Betsy surprised me with a birthday trip to Amicalola State Park in Georgia last week, we had a room at the mountain top lodge with a view of the mountains. This picture was taken through the window last Thursday (March 10). The clouds were threatening, but had lifted enough the at we could see across the valley to the mountains on the other side. Betsy at Amicalola Falls, Georgia. March 9, 2011. Betsy usually doesn’t like me to take pictures of her. She doesn’t realize how beautiful her smile truly is. But I think even Betsy can appreciate the ‘drawing’ of her shown above. 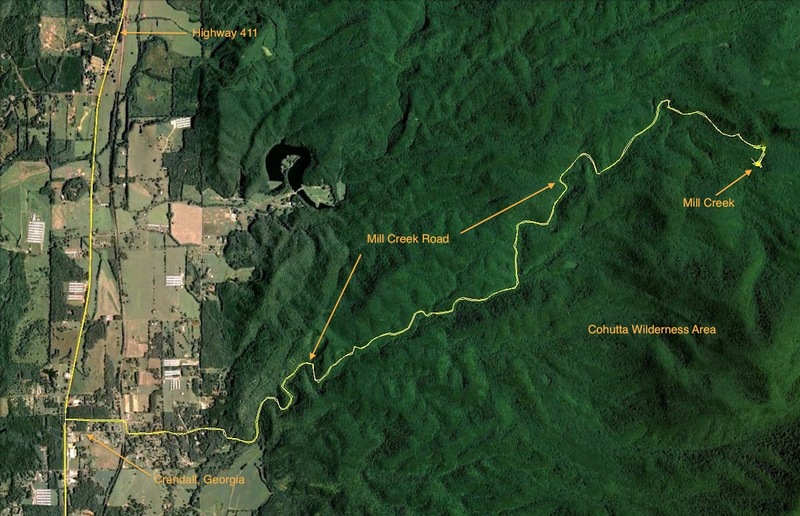 It shows Betsy along the lower part of Amicalola Falls back on March 9. I’m not an artist, but I did create this ‘work of art’. Scott, in his wonderful photo blog Finding Another View, had a post about changing a photo into a line drawing using Photoshop. He said it was easy, and it must be because I got it to work for me. This is the picture I took of Betsy and which is the basis for the line drawing (don’t tell her I posted the picture as well). I can’t say I like it any less than the ‘drawing’. I’m just glad they both show that million-dollar smile. Yahoola Creek Dam, Dahlonega, Georgia. March 9, 2011. 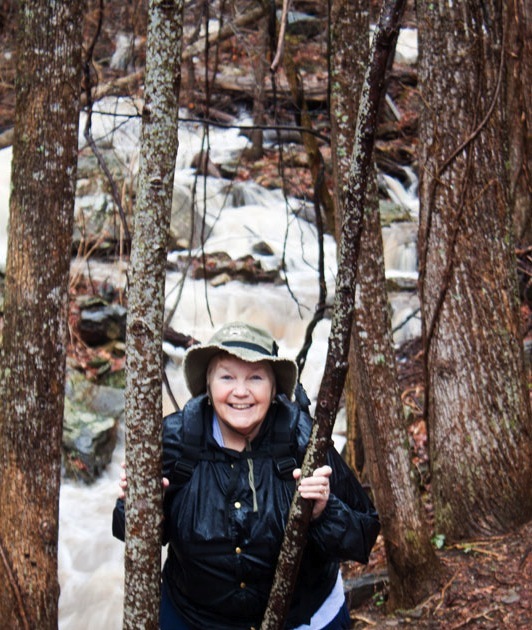 Betsy and I were driving around Dahlonega, Georgia, last Wednesday (March 9), when we crossed Yahoola Creek below the dam which forms Lake Zwerner. 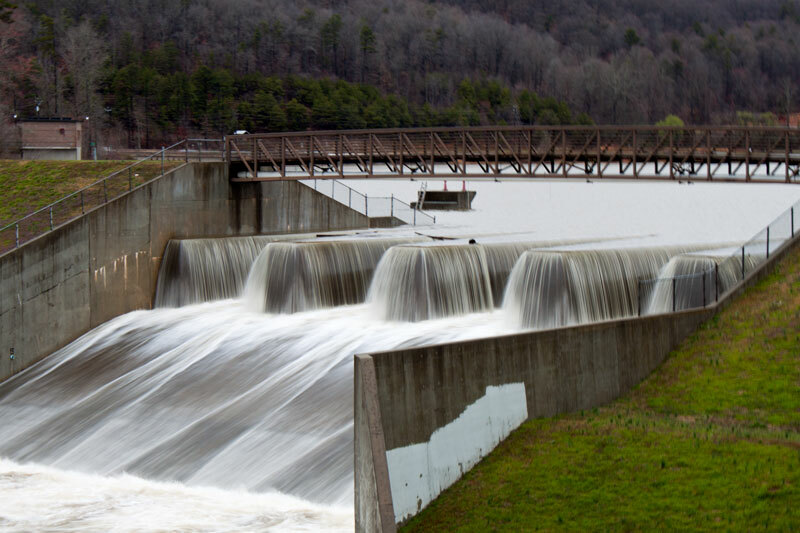 The water overflowing the dam looked so pretty that I just had to stop and snap this picture. 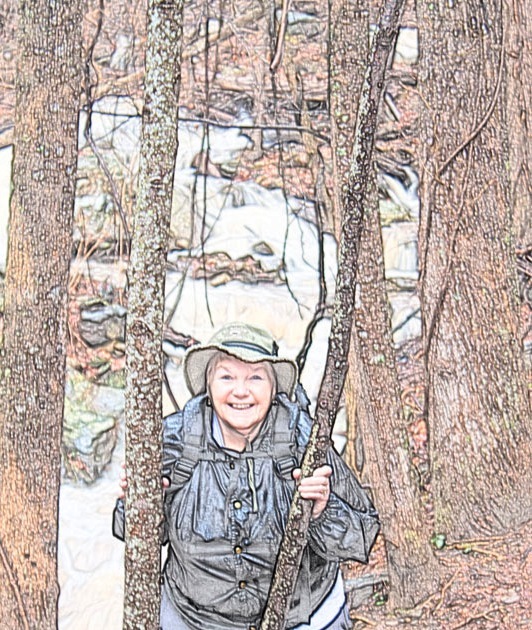 Last Tuesday (March 8) Betsy and I returned to Mill Creek in the Cohutta Wilderness Area of north Georgia. We had been to Mill Creek a couple of times before, but we like the area, and since we were nearby, we decided to visit again. One of the nice things about Mill Creek is the cascade, or shoals, which are reached after a fairly short hike from the parking/camping area. The shoals, as you can see from the picture above, are quite beautiful. The rocks about midway down the shoals, from where this picture was taken, provide a nice spot to sit and enjoy the movement of the water. There are four waterfalls below the shoals, but since we had seen them before and it was getting ready to rain, we decided not to revisit them. Besides, I had something much more pleasant in mind as we sat on those rocks by the shoals. Amicalola Falls, Amicalola Falls State Park, Georgia. March 9, 2011. Betsy arranged a surprise birthday trip to northern Georgia for us. 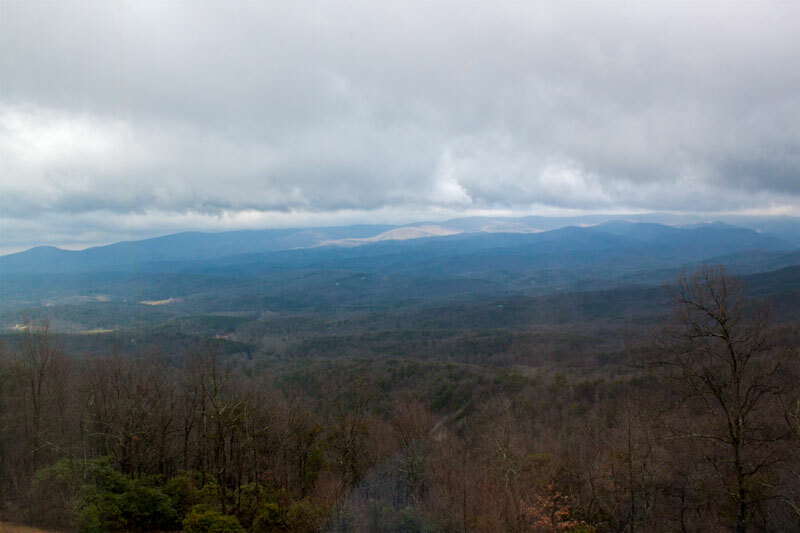 We went to Amicalola Falls State Park and stayed at the lodge on top of the mountain. 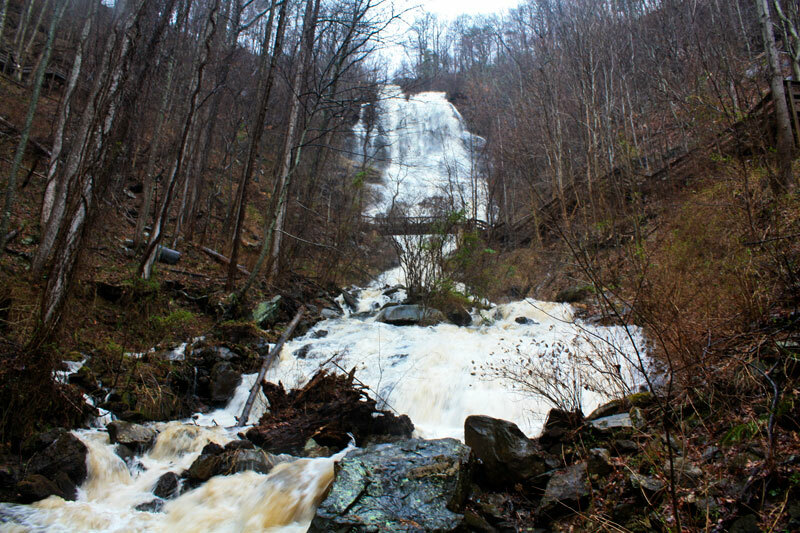 Amicalola Falls is the highest waterfall in Georgia at 729 feet. 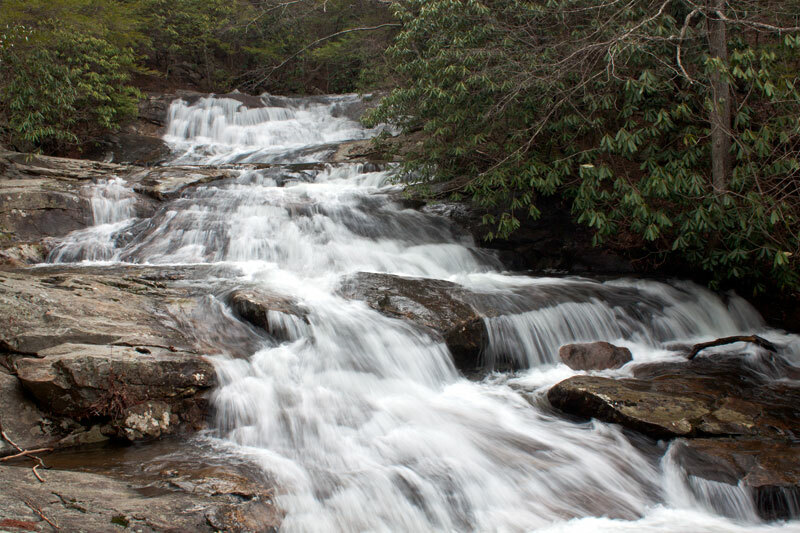 The waterfall consists of a long drop followed by a series of cascades. We arrived at the park late Tuesday afternoon after visiting some other waterfalls on the way. It started raining Tuesday evening and rained throughout the night. It was still raining Wednesday morning (my birthday). There were some advantages to all that rain. 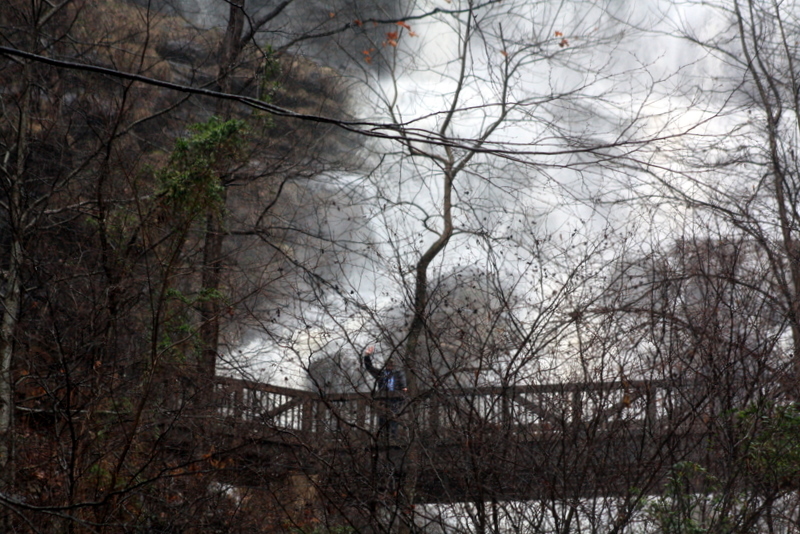 One was that there was a lot of water going over the falls when we visited it Wednesday morning. The other advantage was that we had this glorious waterfall all to ourselves. We drove down the mountain to the pool at the base of the falls, and then started hiking up a trail along the cascades to an observation deck near the base of the drop. 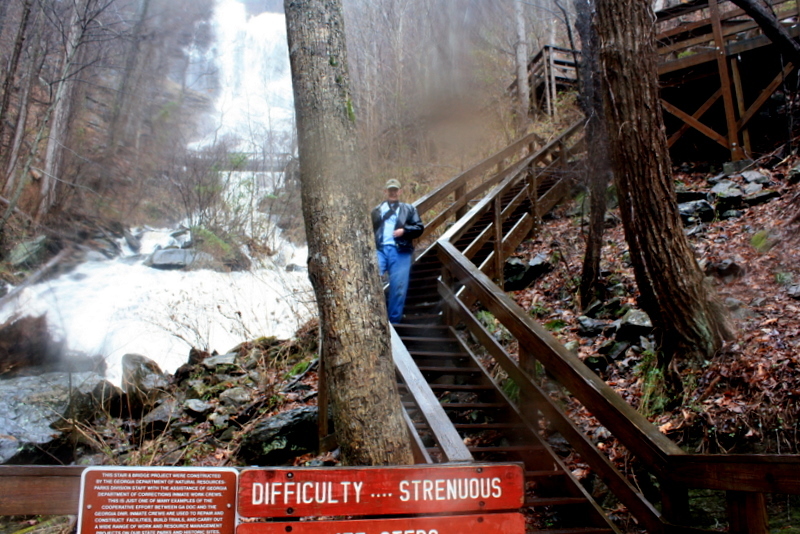 The picture above was taken from the observation deck, and you can see the amount of water coming down the mountain. When we got to the observation deck I noticed a bridge across the falls higher up the mountain (you can see it in the picture above). I wondered if I could get better pictures from the bridge. A sign gave a good reason for not going up there, but I thought I would give it a try. What better way to celebrate my birthday? Well, I made it to the bridge. Betsy, who has more sense than I do, stayed at the observation deck and got this picture of me (you have to look closely — I’m waving to her) up there. I made it back down to the observation deck. You have to look closely, but I was even smiling as I got back to Betsy. All in all I had a great birthday!